There is new scientific evidence that exposure to all welding fume, including mild steel welding fume, can cause lung cancer. There is also limited evidence linked to kidney cancer. Therefore, with immediate effect there is a change in HSE enforcement expectations in relation to the control of exposure of welding fume. 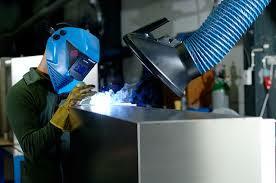 This includes that from mild steel welding because general ventilation does not achieve the necessary control. If you undertake welding activities you should immediately review your risk assessments. You need to ensure effective engineering controls are provided and correctly used to control fume arising from your welding activities. The HSE now state that the control of the cancer risk will require suitable engineering controls for all welding activities indoors e.g. Local Exhaust Ventilation (L.E.V). Extraction will also control exposure to manganese, which is present in mild steel welding fume, which can cause neurological effects similar to Parkinson’s disease. Where L.E.V. alone does not adequately control exposure, it should be supplemented by adequate and suitable respiratory protective equipment (R.P.E.) to protect against the residual fume. Appropriate R.P.E. should be provided for welding outdoors. You should ensure welders are suitably instructed and trained in the use of these controls. If reasonably practicable you should also consider mobile L.E.V. Regardless of duration, the HSE will no longer accept any welding undertaken without any suitable exposure control measures in place, as there is no known level of safe exposure. If you need any advice or assistance with reviewing your risk assessments and selecting the most appropriate controls, then please get in touch. Don’t forget anyone who wears R.P.E. is required to be face fit tested which we offer.